Clicking on Quotes from the main navigation menu in the sidebar will bring up a table showing all of your quotes. Quotes are displayed in the order that they have been added, so all of the newest quotes will be at the top (a sorting function is on the to do list). Status – displays the current status of the quote. Hovering over the status can reveal extra info, depending on whcih status it is. For example, hovering over a ‘Sent’ status will show you when the quote was last sent. # – this columns is for the quote number. Clicking on this will open the quote in a new window. Client – shows the client that this quote for. Dates – shows the issued date and the valid until dates that you have set. Sub Total – shows the ex GST amount for the quote. This is only shown if GST is enabled in the settings. GST – shows the GST for the quote. This is only shown if GST is enabled in the settings. Total – shows the total amount for the quote. If part payment has been made, it will also show the amount paid and the remaning balance that is due. Above the table of quotes is a search filter that allows you to easily filter quotes by simply clicking on this search field and beginning to type. As you start to type, quotes that do not match with what you are typing will disappear. This allows you to easily search and filter quotes by typing the client name, quote number, issued date or even the amount. On the far right column of the table, next to each quote, is a pencil icon and an Actions dropdown menu. Clicking on the pencil icon will take you to the edit page for that particular quote. Email to client – this option will take you to a new screen to email the quote to the client (or anybody you wish). Download PDF – this option will download the PDF version of the quote. 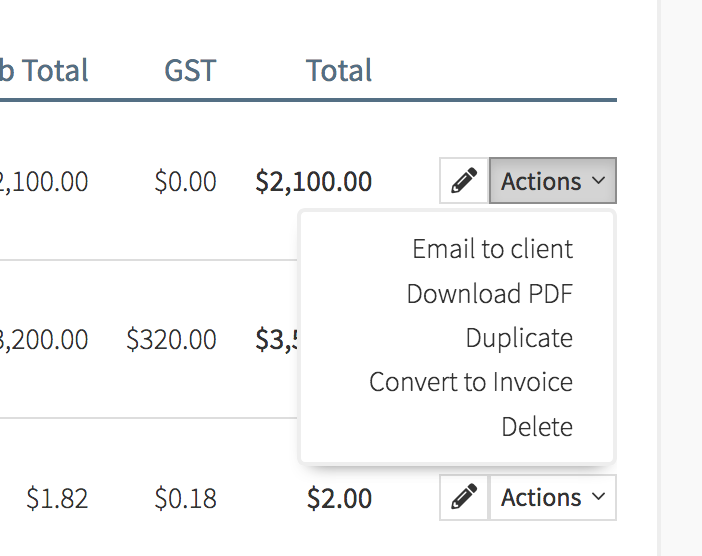 Duplicate – this option will create an exact copy of that quote, which you can then edit as normal. Convert to quote – this option will convert the quote to an quote. 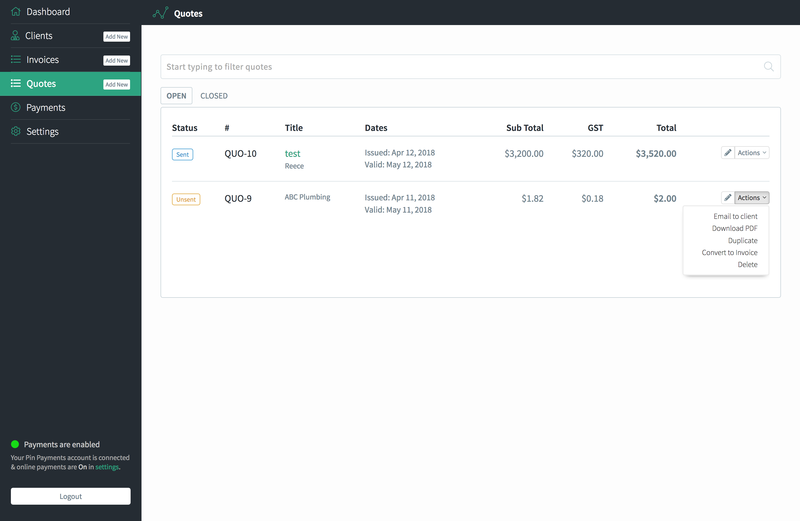 The quote will be completely removed from the quotes table and will now appear in the quote table as an quote with the next sequential quote number. Delete – this option will delete the quote and this action is irreversible.